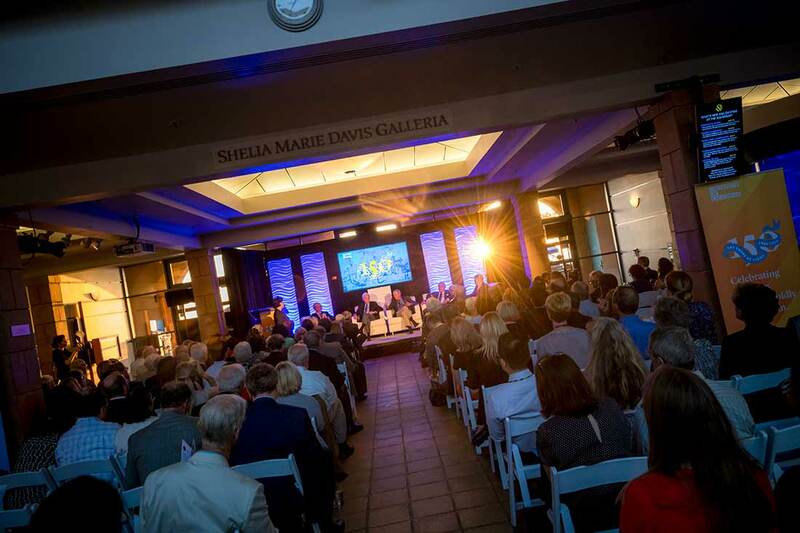 On April 10, in honor of the milestone anniversary, five distinguished UC presidents convened at UC San Diego’s Birch Aquarium for a candid conversation about their unique challenges and successes as leaders of one of the world’s top public universities. The panel included current president Janet Napolitano, as well as former presidents Mark Yudof, Robert Dynes, Richard Atkinson and David Gardner. Chancellor Khosla highlighted the many ways UC has strengthened educational opportunity and led economic growth and in California. 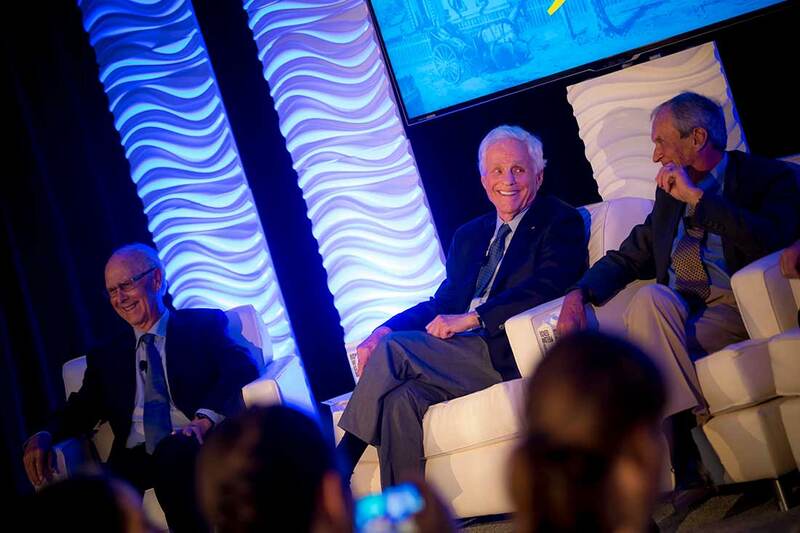 UC San Diego Chancellor Pradeep K. Khosla welcomed more than 150 guests, including George Kieffer, chair of the UC Board of Regents, as well as alumni from across the University of California’s 10 campuses. 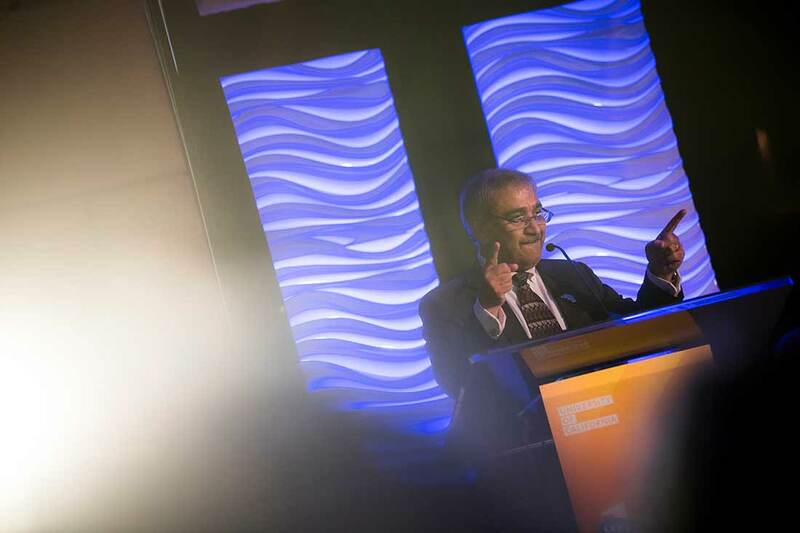 In his opening remarks, Khosla recognized UC’s unique, long-lasting impact. During the panel—moderated by Monica Lozano, former chair of the UC Board of Regents—the presidents delved into many topics, including the university serving as a pathway of social mobility for California students; how countless jobs, technologies and companies can be traced back to UC; and the university giving rise to the birth of the free speech movement. The University of California was founded on March 23, 1868 on the principle that college should be accessible to all Californians. What began with just 10 faculty members and 40 students at Berkeley has multiplied to 10 campuses and 273,000 students. With the university serving as an engine of social mobility, more than one-third of all students come from low-income families, and nearly half are the first in their families to attend a university. And true to its promise, UC enrolls more Californians now than any other time in the university’s history. For more than a century, UC scholars have been driven by an intense curiosity about the world, pioneering new fields and answers to the most urgent issues. From designing the cyclotron—the world’s first particle accelerator—in 1931, to recording the first increase in carbon dioxide in our atmosphere in 1958 and co-discovering HIV in 1983, the university has consistently raised the bar. Today, the University of California conducts 10 percent of all academic research in the nation and oversees five top-ranked medical centers that provide care to more than 4.5 million people a year. When President Emeritus Richard Atkinson first arrived at UC San Diego to become chancellor in 1980, it was the perfect place and ideal time to cultivate a campus that would translate research into practical applications that would benefit the local and statewide economy. Leading UC San Diego at a time when it was already in the nation’s top five for the amount of federal funding awarded, Atkinson helped shape the campus into a hub for entrepreneurship and technology transfer. Later, as UC president, he implemented technology transfer offices at each UC campus and jumpstarted university-industry collaborations. Each president shared the successes and challenges that defined their tenure, from growing federal research funding to the establishment of the Blue + Gold Opportunity Plan. Every day, an average of five new inventions are created at the university. More than 430,000 California jobs, $46 billion dollars in revenue and countless everyday items—from more plentiful fruits and vegetables to compact fluorescent light bulbs—can be traced back to UC. Locally, UC San Diego is the largest employer in the city, and more than 1,000 companies have been launched by or use technology produced on campus. Opportunities abound for faculty and students to turn their big ideas into viable solutions and successful startups. Growing up in Berkeley, Calif., President Emeritus David Gardner would venture to the entrance of the university to listen to activists and others talk about their causes. He went on to describe the birth of the free speech movement on the Berkeley campus in 1964. Gardner explained the importance of continuing to provide a venue for all speakers at the university, even if their speech is uncomfortable. During the panel, the presidents delved into many topics, from the power of applied research to the birth of the free speech movement. Today, UC campuses have become important forums for a wide spectrum of ideas. This year, the university established the National Center for Free Speech and Civic Engagement as part of a concerted educational, research and advocacy effort centered on the First Amendment’s critical importance to American democracy. Through research, advocacy, debate and discussion, the center helps ensure that the next generation of leaders is prepared to defend and advance these values. The University of California has played a leading role in nearly every chapter of California’s storied history. Designed as an institution for all to gain knowledge—regardless of status—the university has surpassed expectations and defied convention. From admitting female students in 1870, far ahead of elite Eastern universities, to educating more first-generation and low-income students than the entire Ivy league combined, UC has stayed true its promise. Posted in Mind and tagged #Alumni, #president, #universityofca. Bookmark the permalink.